WE’VE laughed at them. We’ve marvelled at their mistakes. But finally, after eight years or so of bringing us doozies like the Nevillectomy, Trotts creator Alan Cornell is waving them off, both in search of new horizons. Warrandyte’s fallible family first appeared on page-two of the paper in July 2007 after Diary founder Cliff Green approached Alan to write a regular column. Page 2 was precious to Cliff. It had been the nook of late Herald journalist Lee Tindale, his Smoky Joe column a superb fit. He eventually decided on something amusing: a Warrandyte-flavoured situation comedy. Alan says inventing the little family gave him a number of different characters who “could do all sorts of things and react to different situations”. He admits the character of Gran was “an afterthought”. Which brings us to his decision to end the popular chronicles. ‘Something new’ is something of a tonic for creative people. Along with various literary projects, (he’s written novel The Gentle Art of Tossing and had short stories published) Alan’s quick wit and stellar performances with a guitar are well known to Warrandyte Theatre Company audiences. “It was a very Sunday-school-concert concept when I started performing in the Follies 30 years ago. With some awful things, some quaint things, and every now and then a good thing which sparkled by comparison. But it had a real naïve charm about it that I always liked,” he recalls. The amateur production was Alan’s introduction to performing on stage. Low-key, he characterises his Follies involvement over three decades more or less by saying he “got quite good at writing silly songs”. However, this belies his visible growth as a performer – his improved skills led to paid gigs outside of Warrandyte – and as a writer/director who has created about 100 Follies sketches and directed three productions. One skit, which Alan developed with the help of his Bushfire Press colleagues into the musical Open Season, has since been published and performed by high schools and adult amateur theatre groups. Follies aside, Alan recently co-directed The 39 Steps and this year directed one-act play Arctic Fevers, which has likewise been touring successfully, picking up awards. Alan also worked hard at serious song writing for a time but “never quite cracked” the music industry. “I won a few awards and some of my songs were signed to a couple of record labels. Judith Durham was going to take one and record it as the title song on her new album; the seekers asked me to write a couple of songs for their comeback album,” he reveals. When he’s not doing “fun stuff” (or getting behind a microphone as an emcee) Alan works as a copywriter and creative director who has run small ad agencies. And though he no longer lives locally, the Trotts author remains attached to the township he credits with unearthing his writer-self. “I actually started out in economics but switched to advertising just before moving to Warrandyte,” he says. He talks of living in Balwyn before the shift. When they eventually bought Stonygrad, (a North Warrandyte stone pile, hand built by sculptor Danila Vassilieff) the Cornells found themselves part of a genuine circle. 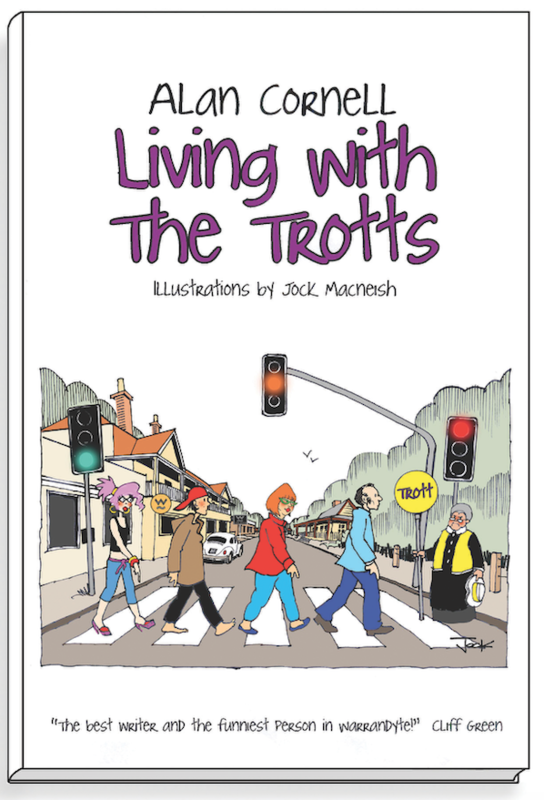 He mentions the enjoyment of seeing his characters come to life each month through one of these “wonderful people”, Diary cartoonist and Living with the Trotts illustrator, Jock Macneish. “Usually, you have an idea and when you pass it on you hope to see it made bigger. And that’s exactly what happened under Jock’s expert care”, says Alan. “Probably not, but they could. I’m not purposefully driving them off a cliff or anything like that, so you never know,” he says. Meanwhile, Trotts fans will be happy to know the little family is being immortalised in a book, to be launched locally next month (see ad for details). Before talking future plans, I ask Alan what he has learned from the Trotts’ antics over the years. “That we’re one big happy family here in Warrandyte. And that writing a column in the Diary is like riding a bicycle – you better be wearing a bike helmet because every now and then you’re going to crash,” he replies, true to his comic nature. Wilful and wickedly funny, the Trotts have left our building. We leave you with an earlier memory of the Diary’s most loveable weekend warrior cocking up a camping trip in The Man from Yarra River. Neville, Narelle, Cinnamon, Jasper and Gran, you will be very much missed.